Exposed! My secret is out! Thanks to my mate Rich (one of the singers), SOUR MASH DADDY AND HIS SIXTY WIVES - the band I play in in one of my 'other lives' - now has a spot on MySpace. Unless you want to subject your ears to the full horror of my guitar-strangling, then at all costs don't click on this link - especially not 'Hard to Handle' ;) However, the other guys are terrific! Here's something fun and intriguing that I got involved in a few months back. It's a project to create a film entirely written, funded and ultimately distributed via the internet. It's going to be an SF/thriller type of story(YAY!) You can contribute by signing up and sending them some money to go towards this endeavour, or (once you're a member) you can jump right in on their discussion forums and help out directly with your advice, opinions, or expertise. It's an ambitious project, but it's all about mustering the talents of an international community of interested parties in the hope of creating something new and ground-breaking - and what's not to like about that? I've really only just been a lurking spectator so far, but this week they had a major members' poll so people could vote on various issues, so I thought I'd mention it to you. Here's a link to the Swarm of Angels homepage, and here's a link to a photo of their rather spiffy poster. 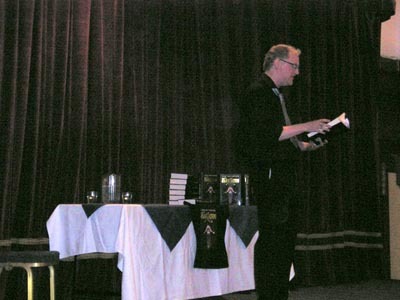 Have just returned from my first ever convention, namely FantasyCon 2006 which was held in Nottingham. I was a bit nervous when I arrived since (apart from my girlfriend!) I didn't really know anyone there, but everyone was wonderfully friendly and approachable: in fact there was a lovely atmosphere of enthusiasm that pervaded the whole weekend. There were some fascinating panel discussions, and I met all sorts of interesting people: booksellers, librarians, reviewers, readers and of course authors, including the delightful Juliet E. McKenna who was a Guest of Honour at the convention. After the banquet that closed the weekend's proceedings, Clive Barker, another Guest of Honour, made a superb speech about how fantastical writing isn't actually a 'genre' at all. What critics call 'naturalistic', 'realist' or 'real-life' writing (he pointed out) has actually only been around for the last four hundred years or so - hardly any time at all in historical terms. But for the human race, storytelling began with the fantastical - stories of gods and goddesses, heroism and magic were the first to be created, all those thousands upon thousands of years ago. Humanity's first narrative impulse was towards fantasy: fantasy was the first means we chose to understand and reflect the world through stories, not this business of focussing on the details of everyday life. So, recently-developed 'realism' is the specialist area of storytelling, not fantasy: it's 'realism' that should be considered a 'genre', not the fantastical. I thought that was a wonderful idea. Hee hee hee! Black Tat's American publication date is almost upon us, and today Penguin US launched a crafty podcast to drum up some advance publicity for the book. If you go to this address you'll be able to hear me doing a short intro and a reading, preceded by a conversation between authors Justine Larbalestier and the especially awesome Scott Westerfeld [Yeah, I'm a bit of a fan of his, actually!] YAY! Today be INTERNATIONAL TALK LIKE A PIRATE DAY! Shiver me timbers! Splice me main-brace! Mind me trousers! ARRR! What an incredible week, though. Hee hee hee! 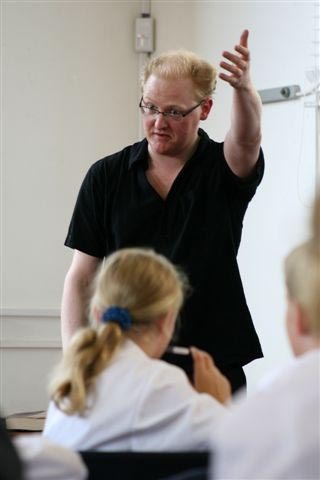 As I think I've mentioned before, I've always aspired to be the kind of writer who does loads of school and library visits, and so far that part of my job has turned out to be every bit as much fun as I'd hoped. Everyone I spoke to all through the week was unfailingly enthusiastic and kind and helpful and lovely. If I tell you everything that happened this page will take even longer to download than it does already, but here are some photos and gubbins to give you a general idea! Day One was mostly about going round as many London shops as possible signing copies of Black Tat. Here's a pic of me doing my stuff at the world famous Harrods! Ruth from RHCB was kindly looking after me throughout the day (thanks, Ruth!) One stop on our itinerary was the big branch of Borders in Oxford Street. 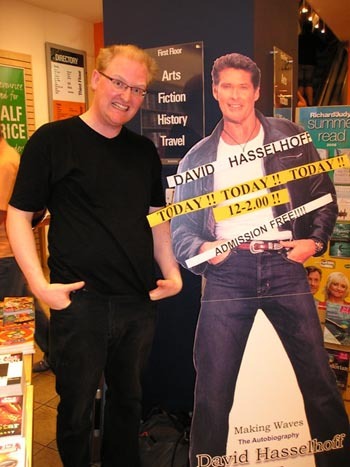 When we arrived, they already had a signing going on: David Hasselhoff was there promoting his autobiography. There were so many people queuing to meet him that the poor booksellers had had to block off their whole top floor and were going quite bananas. Strangely, nobody from the queue seemed to get Mr Hasselhoff and I confused, or rush up to me asking for my autograph by mistake. This was a surprise to me, as I think that the resemblance is positively uncanny...! Day Two: Here are a couple of pics from an event I did at Bristol Grammar School: these photos were taken by Graham Fellows - thank you, Graham! I was a little nervous as this was the first event on the tour, but I needn't have worried: it seemed to go swimmingly. As a creative exercise, I persuaded everyone in the audience to write the opening paragraph of their own novel, and some of the ideas I heard were absolutely awesome: so much imagination in one room - thrilling! Afterwards, to my great glee and delight, we sold so many copies of Black Tat that someone had to rush out to the nearest bookshop and buy more. A huge thank you to the staff and pupils for a truly excellent event. By the way: here's another pic of me looking like I'm trying to take off. What can I say? I tend to wave my arms around a lot! 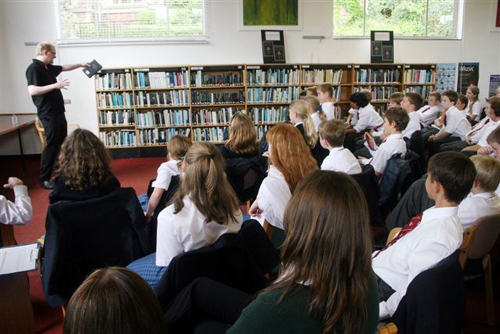 On Day Three I did three events at three different schools around Yeovil. The wonderful Stuart and Sian of Ottakar's in Yeovil drove Rachel from RHCB and I from school to school in their car. We had to go quite fast to get everywhere in time! I don't have any pics from that day (sorry!) but it was a lot of fun: to my surprise, God Himself showed up in one of the signing queues - or someone claiming to be him in the disguise of a young member of the audience, anyhow. Quite by chance (or divine intervention?) I ran into God and one of his mates again afterwards, when I went back to Ottakar's to pick up my luggage. God's friend was buying a copy of Black Tat for he and God to share [God clearly and quite rightly doesn't believe in carrying around a lot of cash] and I was more than happy to sign it for them. Thank you, gents! 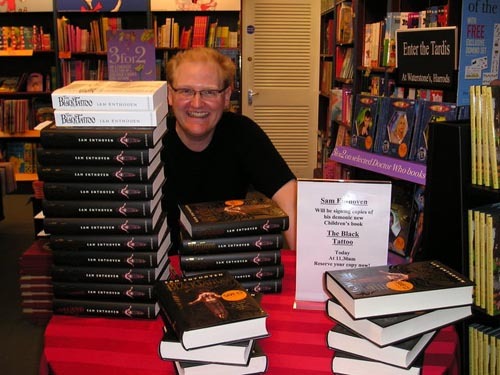 ...and another, of me doing some signing. A big thank you to Louise at Ottakar's Barnstaple for inviting me - I had a fantastic time. 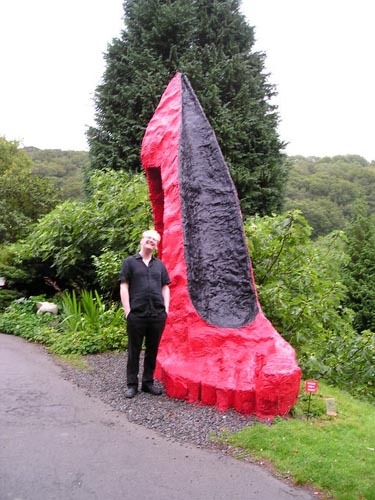 I particularly enjoyed staying at the awesome Broomhill Art Hotel which is entirely filled with all kinds of wonderful sculptures wherever you look, including (of all things) this incredible giant shoe. ...and here's another, of the audience's reaction. You can tell that I had their attention! There were so many excellent questions at this event, that I only got through two of my readings. Outstanding! So there you go! My first ever tour, and as far as I'm concerned it was a great success. A HUGE, HUGE thank you to everyone who helped make it happen. I hope all those who heard me got something out of it, as I know I did. 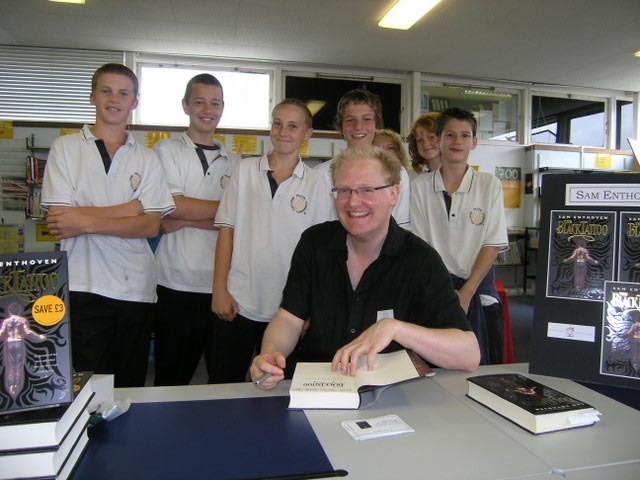 In fact, I'm extremely keen to fix up as many more school, bookshop and library visits as I possibly can! Check out my (first ever!) TOUR SCHEDULE, to promote Black Tat here in the UK! 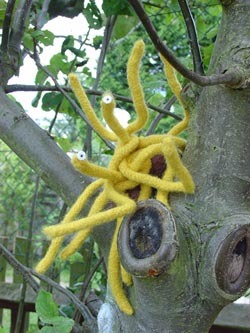 Yes, it's another work of beauty by my friend Elaine (she of the knitted Flying Spaghetti Monster - scroll down a bit to take a look!) 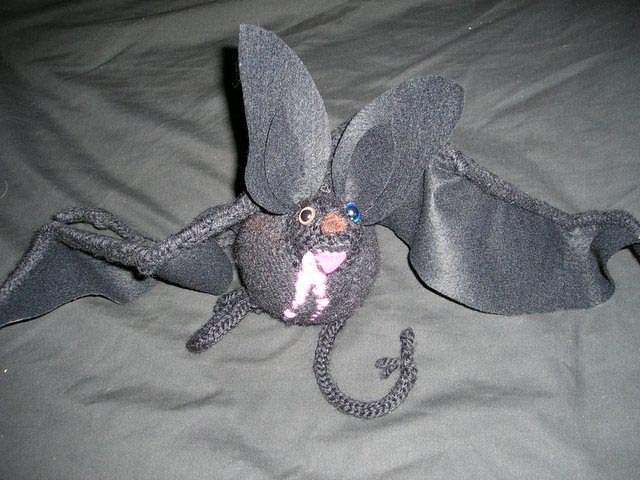 - a hand-crafted vomiting bat of my very own! Check out those lovingly stitched pink chin-dribbles. What more can be said? Elaine is a genius, and knitting is COOL. Hee hee hee! Only a couple of days until the official launch now. In fact, my shadowy network of sinister operatives (all right - my bookseller mates!) tell me that in many bookshops in the UK Black Tat is on shelves already. I'm very proud of this book - in fact right now I think I'm going to be proud of it for the rest of my life. But after working up to this moment for so long (over ten years, if you include all the stuff I wrote that didn't get a book deal!) I'll admit it, I am a little nervous! If you're reading this in the UK and you haven't checked the book out yet, well, NOW'S THE TIME. 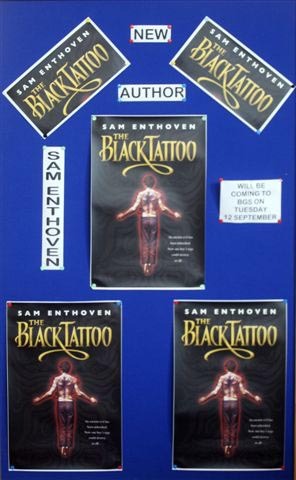 The Black Tattoo is there in bookshops and libraries, waiting for you - or you can order it! -the room was packed. Nearly seventy people kindly turned out to support the cause and wish me and Black Tat well. The noise they made when I got up to do a reading is something I don't think I'll forget as long as I live! A huge, huge thank you to everyone who came along to help me celebrate. HEE HEE HEE! Off-topic I guess, but I HAVE to tell you about this! Tonight I had the enormous good fortune to get to go to the world's second ever showing (the first was at Cannes!) 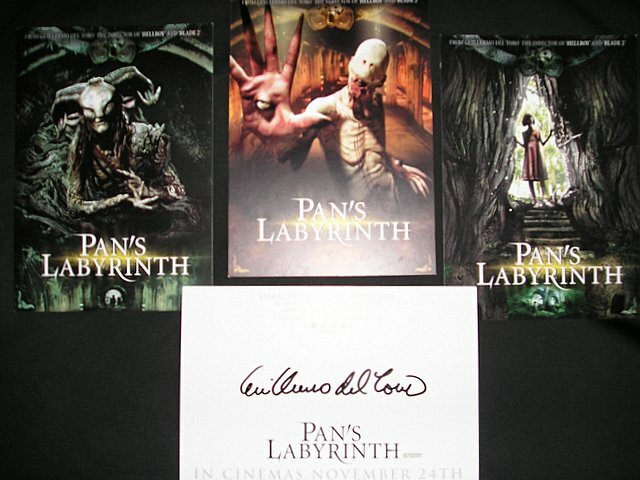 of PAN'S LABYRINTH, the latest film by my absolute favourite film director, Guillermo del Toro. I've loved his films ever since I saw his first, CRONOS, in the cinema when it was on back in 1993(I think). This one, I reckon, is his best yet. Here's a pic I took of the fliers they gave out on the night - including the one that I got him to sign!!! I was in two minds about whether to mention the film here on the site as (in places) it's one of the scariest I've ever seen in my life - and believe me, I know my horror! The story is set during the Spanish Civil War, and is unflinching in the way it shows the real-life brutality and cruelty of the time. Monster-wise(YAY! ), there's a character in it called The Pale Man who just has to be seen to be believed - my brother said afterwards that that scene had him feeling like crawling up the walls! But it's an absolute gem of a film: a proper frightening fairy tale in the true tradition, full of hope, sadness, imagination, passion and beauty. As it turns out, it's now not actually coming out in cinemas until close to Christmas (-WHY??) but there are some trailers and reviews floating around the net already. If it comes on near you (and - ahem! - if you're old enough!) then don't hesitate to go and watch it, it's AMAZING. Afterwards my brother Jack and I set out into the rainy London night to take some photos of a couple of Black Tat's locations in the West End. They came out very well - as I hope you'll agree when they eventually appear (as the WebSphinx and I are planning!) in the FUN STUFF section of this website. Watch that space! I also took the hens'-teeth-rare big-screen opportunity to watch the brain-puckeringly awesome and almost totally inexplicable film MIND GAME. It was stunning: wild and warm and mad and inspiring - I haven't felt that excited about an animated film since the first time I saw AKIRA. However, as often seems to happen with films I love, even though it's been out in Japan since 2004 it's currently almost impossible to get hold of it on DVD over here without going the pirate route and/or paying fabulous amounts of money(RRRR!) Until some US or European distributor wakes up to it, here's a review with pics to whet your whistle. Have you seen LibraryThing? It's a rather wonderful (and incredibly addictive) website that helps you catalogue and keep track of your book collection. Their nifty search facility helps you put up the details of as many of your treasured editions as you like with incredible ease and speed - and then the fun stuff starts! You can find out which other LibraryThing users have similar tastes in books to yourself. You can see what they've got that you haven't, and get recommendations. You can also take a peek at the personal libraries of some of your (ahem!) favourite authors... Hint! Hint! It's sort of like MySpace, only without the fluff and corporate advertising, and run specifically by and for people who love books. Give it a go, I think it's brilliant. Yep, that's me standing in an entire roomful of Black Tats! 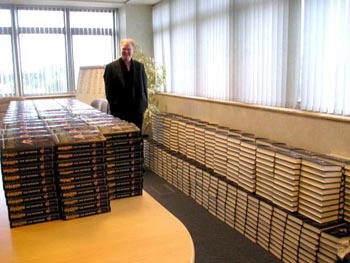 I'd been invited out to the TBS warehouse in Colchester, where I signed ONE THOUSAND SIX HUNDRED BOOKS. Believe it or not, those ones in the pic aren't actually all of them � there was a whole other tableful just outside! TBS are the biggest bookshop-suppliers in the UK. The idea of my signing so many copies of the book was that having signed ones on offer might make booksellers all over the country decide to increase their orders � though I have to say, with my signature, who knows? Let's hope it doesn't have the opposite effect! ;) At any rate, I sat down and set to work. You see that board behind me? That's where the people at TBS record who the fastest-signing authors are! Current top of the heap was Robert Harris, on a frankly insane twelve hundred(plus!) signatures per hour. With my handwriting (one of my teachers once described it as "melted barcode") and my longish surname(!) those kinds of speeds were never going to happen, but at one point I did manage four hundred and eighty in an hour, which apparently is /fairly/ respectable, at least. The people at TBS � and Laura from RHCB � were all wonderfully kind to me. I had a splendid time chatting away with everyone while I signed, and felt very well looked after all day. Plus, when I was finished (I'd gone through five pens!) I was then taken on a tour of the warehouse itself, with all its glorious and mesmerizing machinery. As you can probably tell from my expression in the picture, I'd thought it was pretty exciting seeing all those copies of my book in one room like that � but then seeing them all boxed up and waiting to be sent out to bookshops was a real thrill, I can tell you! All in all, it was a terrific day: HUGE thanks to Laura and all the staff at TBS for being so welcoming and friendly. Who would've thought that writing one's own name that many times could be made to be so much fun, eh?? "The lizards hatched in March, emerging from their leathery eggs as just 50cm long from nose to tail � they will grow to around three metres by adulthood. Their conception already has tongues wagging because mum, Sungai, laid the eggs before mating with our male dragon, Raja. Sungai was loaned to London from Thoiry Zoo in France as part of the European breeding programme, but laid her eggs before she and Raja were introduced. Keepers at Thoiry Zoo reported that she was last mated by their male in early 2003, meaning she must have stored sperm in her reproductive tract since then before fertilising her own eggs when she was ready." "The breeding programme is a valuable component of the global action plan for dragons and zoos keeping them, supporting essential conservation initiatives in Komodo and Flores, Indonesia, as well as raising awareness through the exhibition of these magnificent lizards. The future of the world's largest lizard is far from secure, but the combined impact of captive management and field conservation is having a positive impact." If the idea of adopting an animal appeals to you, take a look at the ZSL website. The WebSphinx would like it to be known that today is Sam Enthoven's birthday. She and all the monsters hope he has a fabulous day! There was talk of a cake but since certain bats provided the icing, it might be adventagous if Sam didn't actually try to eat any of it. The First Finished Copy of THE BLACK TATTOO Arrived Today! As you can see, I'm absurdly excited. The general 'SQUEE! SQUEE! '-ness of the moment was, I admit, slightly diminished by the fact that the book appears to have been clawed, on its way to me, by a passing velociraptor. But even slightly mangled-on-voyage as this copy is, I'm very, very, very, very happy with it. It's taken me ten years of hard work to get to this point: my own book, beautifully published at last. A little off-topic, but today I attended The Chap Olympics. Here's a link to an article with pictures on the BBC website. It was a splendid affair. The Three-Trouser Limbo was, felt, a particular highlight. 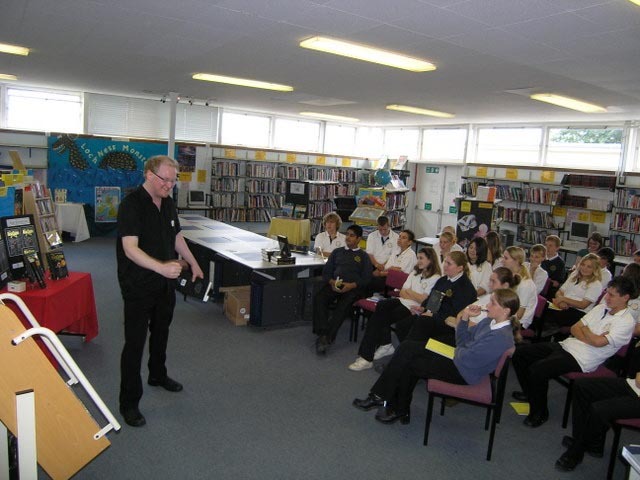 I've always intended to be the kind of author who does a lot of events at schools, libraries, bookshops and so forth, so it had to happen and eventually the day came. There I was, booked for three separate hour-long sessions with sixty young people in each session, to talk about myself and Black Tat, read extracts, and answer any questions. I'd done my best to prepare, timing myself reading various different passages from the book so I could tailor my choice to how well (or badly!) each session was going - but that was all I could do. Not having set foot in a school since leaving my own, I don't mind telling you I was pretty nervous. But you know what? It was BRILLIANT. All in all it couldn't have gone any better from my point of view: I hope everyone who was there got something out of listening to me. I'm very grateful to Ms Kanathigoda for organizing the visit, and to all the staff and students of Park High who helped make this such a wonderful and memorable first go at this. If my future school events are even half as much fun, then this new part of my job is going to be great! 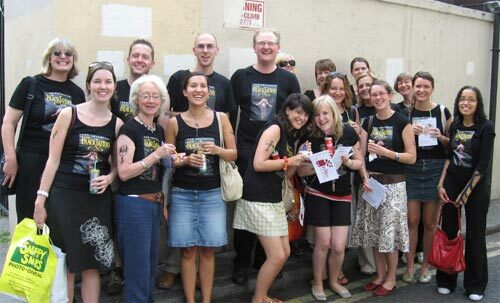 Once a year the British book trade charity BTBS holds a fundraising walk through the streets of London's West End. Since that's where a lot of The Black Tattoo is set - the bits that aren't in HELL, anyway! - it was decided that this year a team should be put together to take part and promote the book. Look how many people kindly volunteered! And check out the T-shirts and the excellent transfer tattoos that Barry – RHCB's marketing genius – supplied for the evening! (Thanks, Barry!) I tell you, seeing everyone in a T-shirt with my name on was a very peculiar feeling. 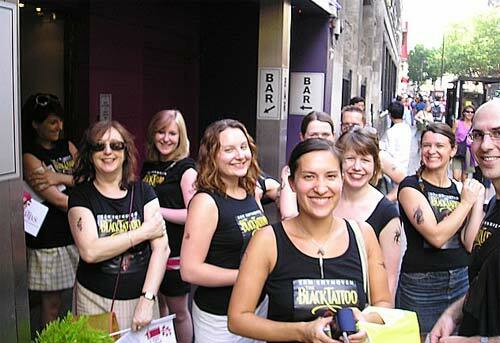 Here's a pic of us forming up outside a certain pub. 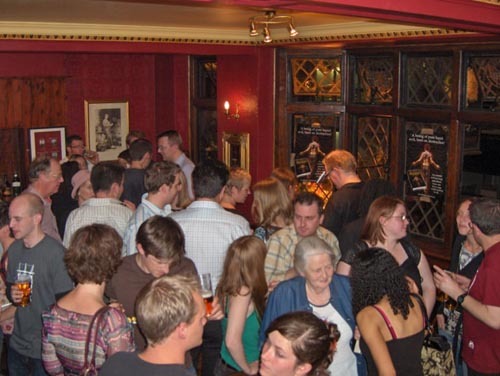 If you've read the book, you'll know that this particular West End watering-hole has a dark and terrifying secret...! 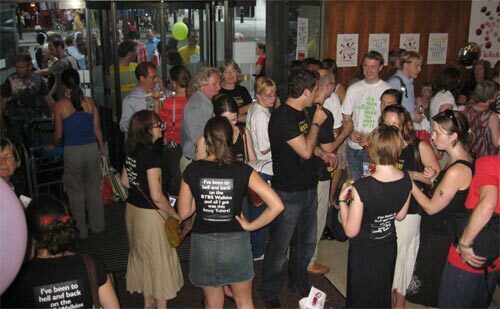 Here's one of some of the team pausing for some well-earned refreshments: you can see what was on the back of the T-shirts. [Incidentally, the gentleman wearing one saying 'It's your city, make the most of it' is the excellent author Dean Vincent Carter. Finally, here's another one of almost all of us. My slightly... *strained* expression is due to the fact that I've just discovered I'm standing in a (dry, fortunately) picturesque mini-moonscape of "pavement pizza" – and from the smell, not one left by a Chinj, either. Well, that's the West End for you! A HUGE thank you to everyone for kindly coming along. It was a wonderfully silly evening, and a terrific way to kick off promoting the book. On with the sinister masterplan! I filmed a short clip this week of me talking about the book for www.MeetTheAuthor.co.uk. You can check it out here. Done in one take, it's a little obvious that I'd just drunk an enormous cup of very strong coffee, but what the hey. I think the 'black on black' colour scheme worked out very well, don't you? I look like some kind of nightmarish shiny talking lollipop – EXCELLENT! This from Kelly, Black Tat's editor at RHCB. I'm HUGELY satisfied with this, as this kind of response is exactly what I was hoping for when I wrote the book in the first place. HEE HEE HEE! "I've had some rather wonderful feedback - was at an event last night run by the Children's Book Circle at North Bridge House Prep in Camden with a panel of several 11-yr-old boys. The woman running the event first read out a short passage from an unidentified book, and the boys had to comment - they weren't that impressed. Then she read out a passage from The Black Tattoo without telling them the title or author (it was the bit where Charlie appears at Jack's window at 4am) and when she'd finished all their hands shot up in the air and they were all desperate to comment, saying things like, 'that sounds really interesting, I want to hear more', 'Charlie seems mad', 'I loved it, it was so surprising,' 'it had exactly the right amount of description and the description was really good', 'it had so much suspense, I didn't want it to stop'. An all-round massive thumbs-up from the target audience!"